The voting system in the US is deplorable. Not only is our methodology outdated, we have the lowest turnout rate of any developed nation. The solution to almost every election-related challenge is to make voting mandatory. And with a little tech reform, we could do it in time for the 2016 presidential election. Part of the reason for low turnout in the US is political apathy, but another big reason is that the act of voting itself is a pain. If the process was streamlined, standardized, and more convenient, more people could vote. More importantly, as our own elected president Barack Obama argued last week, mandatory voting helps ensure that the voices of disenfranchised voters are heard. The idea of mandatory voting floats in and out of national consciousness after every poorly-attended election. And now bad turnout is reaching epic proportions. Last fall's midterm elections had the worst turnout in 72 years: Only 36.3 percent of eligible voters went to the polls. These low numbers skew the results because not all demographic groups are likely to vote. So far, the country's best idea to improve turnout is holding lotteries with large cash rewards just to get people to show up. Not exactly democracy in action. Here's where we can look to the approximately 26 countries which currently have compulsory voting, according to the Institute for Democracy and Electoral Assistance. Australia is often cited as a popular example by American supporters, although Brazil's population is closer to the US in size. What is notable in both those countries is how mandatory voting has lead to larger election-related improvements. 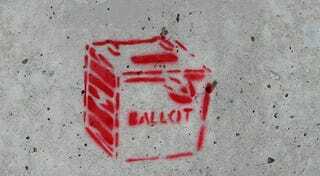 Australia introduced compulsory voting in 1924, and in the years since that time the country has implemented more sweeping reforms that result in fairer elections. These include preferential voting, where voters rank the candidates by preference. Here in the US, such reforms might mean that the election cycle would no longer be consumed by the campaign finance scams and voter ID laws that attempt to suppress the electorate. Critics have denigrated the idea of mandatory voting for decades, saying it smacks of socialism. Civil liberties groups note that choosing not to vote is its own form of free speech. (Although in a mandatory voting system it's perfectly acceptable to turn in a blank ballot—as long as you vote.) But putting aside ideology, a more fundamental concern about mandatory voting is how to implement the concept. What would be the basic systems architecture, design, and technology? Just a few years ago, mandatory voting in the US would have seemed impossible because of these questions. But now we have a precedent: Universal healthcare. The deployment of Healthcare.gov didn't go particularly smoothly (UNDERSTATEMENT), but it is the first feasible model for how mandatory voting might be rolled out. Bear with me here. You might not personally have been required to use the system, but an estimated 16.4 million Americans successfully registered for health insurance using the site. That's a much smaller group than the roughly 250 million registrations we'd need for voting, but it's not an insignificant number. After all the drama, Healthcare.gov turned out to be a reasonably effective way to get people signed up for a government mandate online. What the rollout of Healthcare.gov proved is that there is greater potential for internet-based government processes. The best model in existence is the UK's award-winning digital services portal which brings all sorts of government services online, using one account, in a streamlined, easy-to-navigate interface. A similar US system could be used not just for voting registration, but to also file your taxes, serve on juries, and renew your drivers' license. Could the US pull it off? Maybe the original Healthcare.gov portal was a mess, but since then the federal government has changed its leadership for tech projects. There is now a specific arm of government, including a Chief Technology Officer and a Department of Digital Service, that could oversee such a mandatory voting initiative and ensure that all eligible voters were registered and ready to cast their ballots. Here's the silver lining of bureaucracy: When every American citizen is required to vote, the system would have to handle three times as many voters as it does now. The government would be absolutely required to improve the actual ballot-ticking experience. Most of the country is still checking boxes on confusingly-designed ballots, using the antiquated medium of ink on paper, which varies from polling place to polling place. Designers and voting rights activists have spent decades trying to propose a universal ballot design and voting methodology, which would not only end up saving the country money, it would also instill greater confidence in democracy. While we might not be ready to vote via smartphones by 2016, mandatory voting would be an opportunity to figure out a better process — and one that's secure, too. Each polling place would have the same internet-deployed, touchscreen-based voting system, which is how about a third of the country already votes. In Brazil, where voting is compulsory, 100 percent of ballots are cast this way. The idea of everyone in the US voting on the same day might conjure up images of waiting in line at your local polling place for hours, but additional technology could help make it even more convenient. In Brazil and India, voting kiosks are used as a mobile solution to bring democracy to the streets. Using biometric registration for national ID cards to authenticate voters (similar to the way you provide your fingerprint when you get your drivers' license), touchscreen interfaces with an audio component allow anyone to cast ballots, even if voters can't speak the predominant language or are visually impaired. There's some precedent for this in the US as well: In Oregon, a pilot program let elderly and otherwise incapacitated citizens vote on iPads if they couldn't make it to the polls. By the 2016 election, it would be absolutely possible to implement a combination of programs like this to make sure that every vote is counted. Even if mandatory voting was implemented, and a secure digital system for doing so successfully rolled out, there's still the question of how to enforce the sweeping new rule. Here again we can take a cue from countries that currently require compulsory voting—and add our own special twist. The level of enforcement currently varies from nation to nation. Some countries like Australia and Belgium threaten fines or jail time for refusing to fulfill your civic duty, but these fines are small and often not collected. Others offer specific penalties: In Brazil, you might not be able to get your passport renewed, for example, if you didn't vote in the last election. While a system of fines and penalties could be implemented, I believe one solution is simply making it as easy as possible for Americans to set aside that time to vote so no one will complain about their new civic duties. Which brings me to my last suggestion: There's only one way to ensure that people will take voting as seriously as other national pastimes. In many of the countries where voting is mandatory, elections are on the weekend. We need to make Election Day a federal holiday—one you can spend with your friends and family, heading to the polls together, perhaps, as a socially focused day of action. Not just a day off work, but a country-wide celebration of democracy.